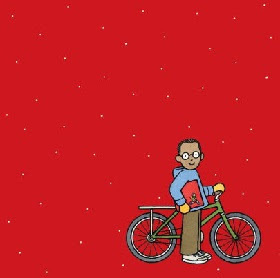 On a snowy street beside an icy ocean a bespectacled boy peddling his bike spots a small, square, red book dropped on the gray paving stones of the street. He picks it up and peddles to his row house overlooking the sea and climbs to the top floor, a glassed-in observation tower complete with telescope. There, succeeding pages in the red book zoom in on an green island where a girl is fishing from her rowboat. Floating up to her is ... a red book. The girl opens the book to see... a row of city houses, one with a tall glass tower. Successive page turns and panels focus closer as she sees a figure seated in the tower and then, in a closeup, the boy with his red book, open to a page picturing her, looking at a picture of him... looking at her, with the suggestion of consecutively smaller pictures of themselves, ad infinitum. The girl's book shows the boy looking back at her with his book open to a picture of himself, looking at her looking at him.... Using a baguette in her basket as bait, she hitches a ride with a pelican which tows her toward the boy, in her haste dropping her book into the sea. Where do stories come from, and where do they go? Readers familiar with the 2009 Caldecott Honor Book, The Red Book (Caldecott Honor Book) will recognize the boy on the bike as the one who found the red book on the last page of the first book, and Barbara Lehman's sequel, Red Again (Houghton Mifflin Harcourt, 2017) picks right up with the visual joke as the magical book is left to be found by the original finder in the first book in a circular story that will delight and bemuse young readers. Even the title is a wordplay with the homophones "read" and "red," a little literary jest that will amuse older "readers," and to add to the fun of this wordless fantasy, author illustrator Lehman also makes use of the trompe l'oeil device of the infinite repeating picture of the boy looking at the picture of the girl looking at the picture of him looking at her. Together these two books bring disparate people together, and inevitably and inadvertently they pass them on to be discovered yet again. For another mind-expanding wordless picture book, share this one with the similarly themed amazing and amusing 2007 Caldecott-winning book, Flotsam, by David Wiesner. (Houghton Mifflin Clarion).